Whether hymns should be sung, or not sung, at Mass, and which hymns are acceptable, is a fraught topic. The issues are described in more detail in an interview I did with Professor Peter Kwasniewski, called “The Propers of the Mass Versus the Four-Hymn Sandwich.” (which was published at Homiletic and Pastoral Review and republished on NLM). The phrase “We should not be singing at Mass, we should be singing the Mass” is used often among Church musicians and liturgical experts who believe it is important it is that the actual texts of the Mass be sung. San Francisco Archbishop Salvatore Cordileone wrote this in his “Foreword” to The Proper of the Mass for Sundays and Solemnities, by chant composer Father Samuel Weber, O.S.B., who founded with Archbishop Cordileone the Benedict XVI Institute for Sacred Music and Divine Liturgy at the archdiocesan seminary. “It is often said, and rightly so, that we should aim at singing the Mass not singing at the Mass, but old habits die hard, and in many places the ‘four-hymn sandwich’ is still being served, a relic from the days before the Second Vatican Council when provision was made to allow vernacular hymns to be sung at Mass.” The archbishop went on to write that the best hymns can enhance our liturgical celebrations, but that hymn singing is a recent innovation in terms of Church history. Experts claim that singing of any old hymns at Mass became entrenched after Vatican II because vernacular versions of the Proper texts were not available, and hymns filled the void. Many feel that choirs and congregations should be singing the texts of the Mass, which are the Ordinary and the Proper texts of the Mass. Venerable Pope Paul VI wanted congregations to be able to sing the Ordinary in Latin set to simple chants, as published in his booklet Jubilate Deo. And eighteen more-complex settings of the Ordinary are available in the Kyriale. Many musicians, including Father Weber, are composing English versions of the Propers. 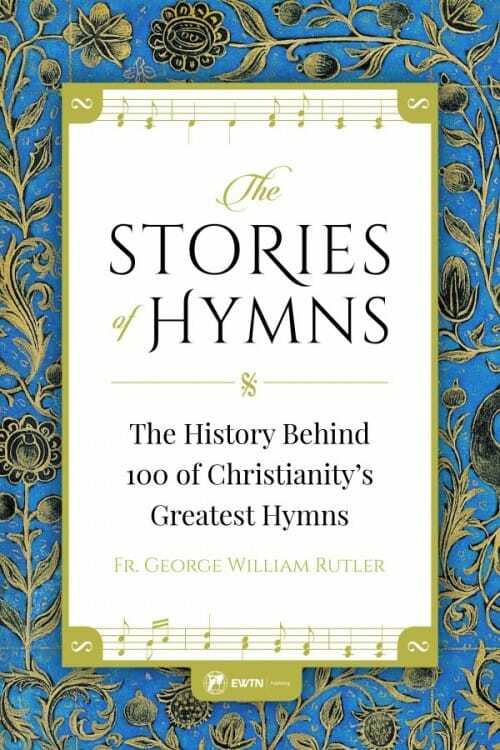 Because of the controversy about where hymns belong in Ordinary Form Masses, my questions to Father Rutler focused mainly on the paragraph at the end of his “Preface” to his Stories of Hymns, in which he wrote about how the hymns he wrote about may be included in Catholic liturgy. But that doesn’t mean that I didn’t read and enjoy the rest of the book, and I hope you will read and enjoy it too. Where Can Catholics Sing These Wonderful Hymns? The hymns that follow complement the Liturgy but are not part of it. The whole Mass itself is its own gigantic hymn, and it is only by indult that it is said at all instead of being sung. It is liturgically eccentric to “say” a Mass and intersperse it with extraliturgical hymns. Hymns may precede or follow the Mass, but they should never replace the model of the sung Eucharist itself with its hymnodic propers. In the Latin Rite, that model gives primacy of place to the Latin language and Gregorian chant, according to numerous decrees, most historically those of Pope Pius X in Tra le Sollecitudini and Vatican II’s Sacrosanctum Concilium. The Church has normally reserved other hymns for other forms of public prayer, especially the Daily Office. And, of course, all hymns can be part of private prayer, following the Augustinian principle that he who sings prays twice. What do you mean by: “The hymns that follow complement the liturgy but are not part of it”? Father Rutler: Those hymns would qualify as “tropes,” or embellishments of the proper liturgical texts, but not substitutes for them. The guidelines for the Ordinary Form would accord a certain validity to hymns, other than the traditional Propers, as part of the Liturgy provided the texts are approved by the legitimate ecclesiastical authority, but this is by way of exception. RTS: Do you agree that we should not be singing at Mass, we should be singing the Mass? Father Rutler: Since the Mass is the highest act of praise, and singing is the highest form of praise, the Mass is a song, and is not therefore interrupted by song. RTS: Can you explain what you mean where you wrote, “The whole Mass itself is its own gigantic hymn, and it is only by indult that it is said at all, instead of being sung.” How is the Mass a hymn? What indult do you mean? Father Rutler: The Second Vatican Council described the Holy Eucharist as the song of the Heavenly Jerusalem brought to earthly altars. For expediency in the Latin Rite, recitation is permitted instead of chant, but this should be only by exception. Expediency is not a concern of the Oriental Rites, or of Jewish prayer, for that matter. In Heaven, there is only singing, no mere talking. Father Rutler: The Propers are the Scriptural texts and other sacred texts. The Psalter is the Church’s main hymnal. To recite Psalms, rather than chanting them, is an oddity. It would be better to sing brief texts (antiphons) rather than rather drearily recite a Psalm between the readings. Indeed, as I understand it, the provision of lengthy Psalm verses between the Readings was granted at the last moment in the revision of the Mass, to satisfy a minority opinion. 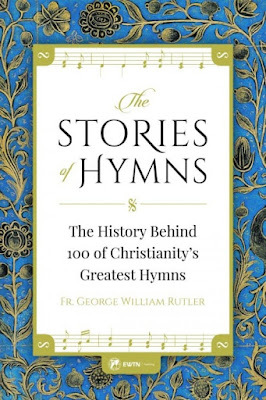 RTS: If hymns should not be sung during Mass, when might hymns from this rich collection you wrote about in Stories of Hymns be sung by Catholics? Father Rutler: I did not say that hymns should not be sung at Mass. In the Ordinary Form they are permitted, but should not replace the Propers (for example, the Introit and Gradual). A hymn after Communion would not be inappropriate but the “Hymn Sandwich” of an Entrance Hymn, Offertory Hymn and Closing Hymn accompanied by a static “said” Liturgy should be avoided. RTS: You also wrote in your “Preface” that outside of the Mass, these hymns might be used in the Divine Office and private prayer. The stories for some of the hymns also often mention how stirring some hymns can be when sung in procession, for example, the Easter hymn “Hail Thee Festival Day,” with its alternative verses that can make it also appropriate for processions on Ascension Day, Pentecost, Corpus Christi, and at dedications of churches. You also wrote about “Daily, Daily Sing to Mary” as “a marvelously raucous hymn, which is especially suited for processions.” And you wrote about a favorite hymn, “Jerusalem the Golden,” which you fondly recalled singing as a choirboy. Do any others still appeal to you particularly? RTS: I remember enthusiastically singing, “And Can it Be That I Should Gain,” “The Church’s One Foundation,” and “All Glory, Laud, and Honor”–and other hymns that I recognized in the Stories of Hymns–when I worshipped at an Evangelical Free Church, which is one of the Protestant denominations I sampled on my way back to the Catholic Church after I lapsed as a college student. I missed that enthusiastic hymn singing when I came back to the Church, until I started singing with a Gregorian Chant choir, and all the treasures of the chant repertoire opened to me. More important than hymn singing is the Eucharist, and the Eucharist and the teaching authority of the Church are a large part of what brought me back. Now it seems to me that Protestant denominations filled up their worship services with long sermons, and lots of hymns, because they removed the Sacrifice out of the Mass. How do you use music in Masses in your current parish, St. Michael’s in New York City? Do you, the choir, and/or the congregation sing the Propers? It is highly preferable that the choir be in a loft, or at least positioned to support the people’s voices. Choirs should never face the people. And “song leaders” are entirely counter-productive. No ritualistic: “Please join us in singing…” and so forth, and no arm waving. Highly recommended on the topic are two books: Why Catholics Can’t Sing by Thomas Day, and Real Music: A Guide to Timeless Hymns by Anthony Esolen. We sing the liturgical texts and, as provided in the rubrics for the Ordinary Form, we usually have an additional hymn at the Offertory. I think that if there is a hymn, it may best be at the end of the Mass. Hymns should not displace the liturgical texts, and normally one hymn is adequate. RTS: By saying that your congregation sings the chants, do you mean the Ordinary chants? If the Ordinary is chanted by the congregation, what settings do you sing? Do you cycle during the year through the some of the eighteen Gregorian chant Masses available from the Kyriale, such as Mass I: Lux et origo (for Paschaltide), Mass XI: Orbis factor (for Sundays per annum)? Or do you follow a simpler scheme? Father Rutler: To encourage participation, the Missa de Angelis is a Plainchant setting that everyone can sing easily–then on special feasts other Gregorian settings can be sung from the choir. RTS: What might you add to help Catholics who are attached to singing their favorite hymns at Mass, and who might object to the idea of any change? Father Rutler: In a time of cultural decay, such as ours, the Church has an obligation to preserve and promote the best human achievements, including music, and the visual arts. The Church must convert the barbarians and not be converted by them. Many of the aging “baby-boomers” who resist change, imposed it wantonly on others right after Vatican II. That period of aesthetic destruction may take a long time to repair, but bad music should not be allowed to drive out the good, just as bad money should not be allowed to drive out good money. To deny that there are superior forms of aesthetics is simply to enlist oneself in the ranks of the relativists for who quality is nothing more than opinion. That is not aestheticism; it is narcissism. The astonishing collapse of church attendance in recent decades, cannot be blamed on St. Gregory, Palestrina, and Mozart, and there are many reasons for it other than a defective psychology of worship, but the cloyingly grotesque, pseudo-Christian elevator music in many parishes is not guiltless of the damage done in those post-Conciliar years. Roseanne T. Sullivan is a writer from the Boston area who currently lives in San Jose, CA. Sullivan studied graphic design, painting, journalism, fiction and poetry writing while completing a BA in Studio Arts and English, and an MA with writing emphasis at the University of Minnesota. She has a deep and abiding interest in sacred music, sacred art, liturgy, and Latin, and she teaches Latin to homeschoolers. Many of her writings and photographs have appeared in the National Catholic Register, the New Liturgical Movement, Regina Magazine, Latin Mass Magazine, and other publications. Her own intermittently updated blog, Catholic Pundit Wannabe, is at catholicpunditwannabe.blogspot.com.